Color is spotty but is coming along. Best color I saw over the past 2 days was along Route 4 between Killington and Woodstock in Bridgewater and along 100A in Plymouth & Bridgewater. Woodstock is still mostly green & muted yellows. Found some good but spotty color in Pomfret (may actually be Quechee - don't have map in front of me) along Joe Ranger Road. Picked up ctyanky at the inn in Woodstock and went to VINS in Quechee. Fantastic place. Highly recommend. Then we headed to Woodstock and did a bit of shopping and had dinner with Minnesotaman. Tried to go to Worthy Kitchen but it was a mob scene so we ended up at Bentley's right in town. I drove from Rutland to Woodstock via Route 4. Very overcast and misty rain. Colors are really emerging at high elevations. Saw best color of the weekend along Route 4 especially right around Bridgewater Corners. Picked up ctyanky at the inn and headed straight to Sugarbush Farm. Highly recommend this place. A real working farm with a shop in the former farmhouse. Colors from Woodstock up the hill to Sugarbush Farm are still early but looking good. We then headed up Cloudland Road to check out the home/farm of a famous mucisian which is a big stop for photographers. (https://newenglandphotography.files.wor ... ermont.jpg ) Colors are not ready there yet. Kept headed up Cloudland Road and stopped at Cloudland Farm to see the view and got to see some turkeys that are being raised there. We continued on Cloudland to Galaxy Hill to Old Kings Highway to Joe Ranger Road which brought us into Quechee. A spot of really good color is emerging along Joe Ranger Road at the height of land near the Seaver Hill Farm. Next we headed to Jenne Farm in Reading. Color still early along Route 106 with some nice color emerging in the area of the golf course. 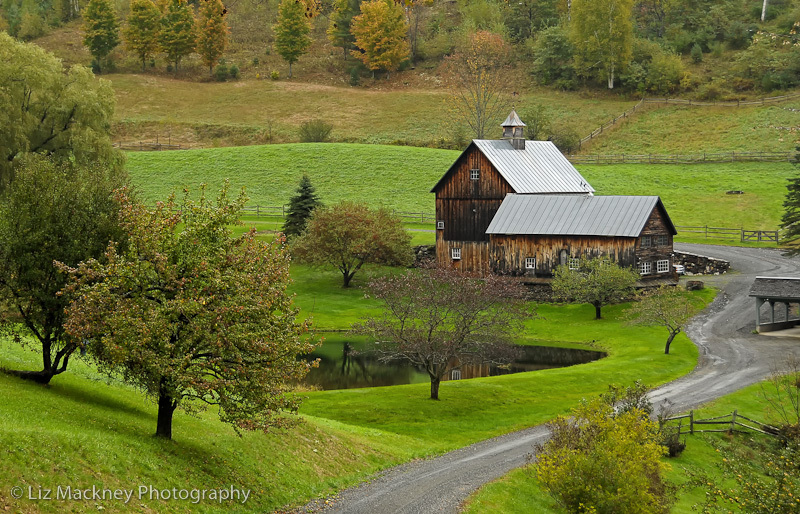 Jenne Farm is a must see as it is one of the most photographed places in the state. Color still early there. Woodstock Farmers Market for lunch - great place and then Billings Farm for the afternoon. Moral: Color in Woodstock is still early but up in elevation in areas surrounding Woodstock has some nice color emerging. I think next weekend is going to be the jackpot. Great report bm! But you forgot to mention the Quechee shopping extravaganza! What a super nice area to buy gifts and Vermont products. I loved the Farmer's Market in Woodstock as well. We stopped at the Taftsville General Store which was so quaint with lots of Vermont everything. Joe Ranger Road off Old Kings Highway is amazing! There were a couple of long view spots where I would say peak was coming by mid week at those higher elevations. I've never really explored the Woodstock area in depth and it is so beautiful! It was great to meet Minnesotaman for dinner! He is so well experienced with VT and NH one would think he was a local! Nice dinner at Bentleys in town as well. A very fine gentleman indeed! We took a horse drawn wagon ride at Billings Farm with one team of their stunning draft horses. What a place! The museum is gorgeous and there was an Apple and Pumpkin Festival going on all day. The barns/stalls are beautiful and we ended the day watching the milking of the cows. I would highly recommend Billings Farm. Unfortunately we ran out of time and couldn't go hiking on Mt. Tom in the Marsh Billings Rockefeller State Park so I'll save that for another time. It was cloudy so we probably couldn't get a view at the top anyways. I may just visit Woodstock during the Christmas holidays for their Wassail Festival. Excellent report bm and CT. I'm sure a lot of people will benefit from your findings. If I had known you were headed out Old King's "Highway" to Joe Ranger I would have told you some stories last night. Old King's was surveyed in 1763 by agents of King George, the very King George excoriated in the Declaration of Independence--hence, presumably, the name of the road. Old King's must be one of the oldest roads around here--it was surveyed only two years after Pomfret was chartered, and about ten years before anyone even settled in Pomfret (or in Woodstock). Old King's dips into a vale, and in that vale perhaps you noticed an old farm, the O L St John farm, which has a beautiful weathered old barn and outbuildings. It is one of a handful of barns that remain from the 1880s, when the great old barns around here were built. Its owner, like the owners of many of the old barns in this area, has spent quite a bit of money keeping it in good repair, not for any practical reason--it would be cheaper, by far, to tear these old things down--but out of a dedication to preserving the look of the place, and its history. The O L St John barn and its outbuildings look best from Dana Road, which runs into the dale from the north. From that vantage point they look like the stuff of a Wyeth painting. The farmer keeps cattle. Sometimes in the morning they bellow and when they do it booms and echoes in the dale. Good as any loon song, I think. Past that dale, where Old King's turns into Bunker Hill Road (which then turns off to Joe Ranger), there is a tiny roadside cemetery with fewer than a hundred markers, the kind of cemetery you find on back roads all over the state. You most likely drove past it--it is overhung by large trees, and some trees and a thicket block what would be a long view to the north, and has only a low broken wall around it, and a busted up old iron gate--certainly not what its founders must have envisioned. Like Old King's, it has an interesting history too. I think the oldest marker in the place belongs to someone named John Gibson, who moved from New Hampshire to Pomfret in 1806 when he married a Pomfret woman. He died just ten years later, at age thirty five, two days before New Year's Day in 1816, after lingering for nearly two months--his back had been crushed by a beam while he was assisting in the raising of a building. Two hundred years later we don't have these kinds of accidents. Instead, we die in offices where we first linger for decades. So much more modern. Minnesotaman, I love reading these stories! You are indeed a wealth of information. Just love finding out the history behind these things, it makes the journey much more fun! Please continue to share such delightful information! Minnesotaman, we made it to the Old Kings Highway today and it was beautiful! Loved the barn and the bellowing cows, just perfect! Then on down Cloudland road, colors where great, and I loved the new red paint on the house at Sleepy Hollow. Then on to Jenn Farm, and a stop at the Vermont Country Store in Rockingham. A full day, color is good, not as far along down south but looking good. Thanks again! I stop at the Rockingham store on the way to Chester for their fall foliage festival. I like it better than Weston because it is less crowded and it has almost the same merchandise. Their display out front is nice, isn't it? Woodstock/Pomfret is a mixed bag. Some areas are still ripening (upper Cloudland), some are nearly leafless (lower Cloudland and parts of River Road along the Ottaquechee). Joe Ranger and Galaxy Hill are good, but mostly orange. The last few years upper Cloudland has continued to brighten until around the 18th. The leaves are still on, so it could happen. As usual, Woodstock is mostly yellow and orange--more orange than usual. Bridgewater has good color right now (Gold Coast, No. Bridgewater Road). I will likely get to Jenne Farm and to the 1902 Maple Grove farm in Barnard in the next couple days. If it rains or if there is much wind leaves will drop in the Woodstock/Pomfret area very fast. I was on Turkey Hill in Northfield today. It was very nice, a lot of reds at the top-although nothing matches what happened in the NEK. Perhaps a day past peak, but still some green trees. I also drove the roads above Warren and Waitsfield, the Bragg Hill area, and the gap roads. Good color, esp views from the Common Road, but all look to be a day or two past peak. The gap roads are starting to go fast, and will not withstand much weather. The west end of Lincoln gap/Maule's Roost area is good. The west facing overlook at the summit of the Appalachian gap is all yellow, bright, but yellow. It was quite windy at the tops of the gap roads today, the air was full of leaves. Quite bright along 17/Gore Road and nearby back roads. Beaver Pond along 17 just north of Jerusalem is outstanding, as usual. There was road work there today, however, which made it difficult to stop, although I succeeded. Kent Pond (Killington) is excellent, at peak. BM/CT: I was going to head up to Hinesburg but with clouds and rain coming in for tomorrow from NW to SE I will probably be in Andover (East Hill), Townshend (Scott Bridge and area behind the dam), and Wardsboro/Newfane, perhaps Grafton. Based on my experience, there should be good color in those areas about now. If I can get there before the weather I will also probably go to Colvin Hill/Danby. I will let you know either way. Minn: You give the most amazing reports! You really know your roads and the up to date take on the color is great. bm took me on Colvin Hill in Danby and it is really awesome. I'm curious as to how the 1902 farm in Barnard is doing. Isn't that one hard to find and are you the one who had a conversation with the owner last year or the year before? I'll be hoping for nice color on my day trip Saturday to Townshend. We'll stop at the Scott Bridge after the horse show and on our way home. Do you have time to stop in Belmont (part of Mt. Holly)? My friend from Chester says it is a beautiful town that not many people go to. I saved this paragraph for my travels next year. Star Lake should be in peak. Last, stop at the Wardsboro Country Store. I met the owners over my travels last week. Small world! They are awesome! Geez, doesn't sound like your wife had much opportunity for shopping per your intense report! minnesotaman wrote: ll likely get to Jenne Farm and to the 1902 Maple Grove farm in Barnard in the next couple days. Thanks for the updates. I tried locating 1902 Maple Grove Farm last season without any luck. Are you willing to share what road it's on? I plan on being in that area this Saturday. Hi Mark: here is the link. I think you will find it quite amusing especially the last post! Minn: Had to find this for Mark. Did you get there today? Mark, I hope you find it Sunday! Your never ending quest! also try webster hill road, off pomfret road. there is a good view to the south. it is in the general direction toward the maple grove farm. i was there early this morning. it was too cloudy and dark to get a sense for the color, but it usually comes in late there, so it should still be ok. Thanks ctyanky and minnesotaman for the guidance. I will be checking out these roads for sure on Saturday. I'm sure I'll find it now. BTW, I was up in Warren and Waitsfield on Columbus Day and was very pleased with the color display. My camera was even smiling! I'd like to see the Friesian show in Townsend at 1pm if possible. I'll let them know by Friday if so. I wonder if they will let me take video or pictures during their show? Mark: you can take pictures and videos! You can also take pictures in the barns. Let me know if you are going and we'll meet up with you there. The show is totally amazing and you won't believe the intensity of the Friesians! The show is outstanding and the barns are gorgeous. Have you any experience with Friesians? Take a look at Othello and Mathijs! They bring them to the rink, all kinds of riding, in hand, at liberty and the ones where the Friesian mares run with their offspring is the best! I took a friend who rides a few years ago and she had tears in her eyes because the whole show is just fantastic. I know you will love it. You have to pay cash at entry (25). No credit cards. The owner has plenty of seats left as well. Can you tell how excited I am? I can't wait to get there. We are hitting the Townshend pumpkin festival at 10 a.m. and then will head over to the facility at 12:30. There are two ways to get there. The upper and lower roads are actually a loop to Maggie Ladd Road. I love taking the upper road first and come back on the lower road. I'll find their names later. It's an experience of a lifetime (I guess if you love Friesians) and you won't regret your visit! I'm looking into a week long stay for next year for an all day horsemanship experience!